Buy this for: Musicians or other production types who need to attach an iPad on a tripod-like unit (or a microphone stand) in a much easier way. Along with physical keyboards of various forms, the most popular accessories for iPads are cases, again, of wide variety. But there are many times when a case is simply inappropriate -- sure, they’re great for travel, protecting the device, as well as making a fashion statement, but often impractical in applications where the device needs to be easily and constantly available and usable, but also secured and held in a position suitable for operation. For example, I use my iPads both as video monitors (monitoring CNBC and other stations while working at my desk) and in recording and other studio production settings. I need, then, a stand for the iPad. And I’ve tried many of these, most of which don’t securely hold the iPad or otherwise even reliably mount to a desktop. They were constantly moving in operation as poked or swiped, with the iPad itself falling off the stand or the stand even falling off the back of the desk -- no damage done so far, fortunately, but with accompanying bad language nonetheless. The iKlip Studio is a desk stand for any version of the iPad. It works in both portrait and landscape, and the angle is adjustable. And it really is universal, as the tablet just rests in the unit, so it will work with most other tablets, e-readers, and similar devices. Perhaps most importantly, the rubber feet keep the unit stable and stationary on desktops. If you’re looking for even a bit more adjustability, the iKlip Stand will likely fill the bill. This unit is essentially an iKlip2 with both desktop and clamp riser mountings that holds the iPad off the disk, freeing up space, allowing the device to be positioned higher up, and providing a broad range of adjustability for, again, essentially any application. Price: $25 for Tag, $35 for key fob, or $60 for bundle; free app. Buy this for: Anyone who’s always misplacing their keys, or wants to make sure they never leave their phone when they go somewhere. The Proximo key fobs and tags are a couple of devices that team up with the Proximo app (free for iOS and Android users) to make sure that you never misplace items again. The devices (either a keyfob or a tag that also can be placed on a keychain) use Bluetooth to communicate with the app on the smartphone. When the devices are within range of each other, you can hit a “Find” button on the phone and the key fob or tag will start beeping to help you find it (there’s also a “radar” indicator that tells you if you’re getting close to the device. 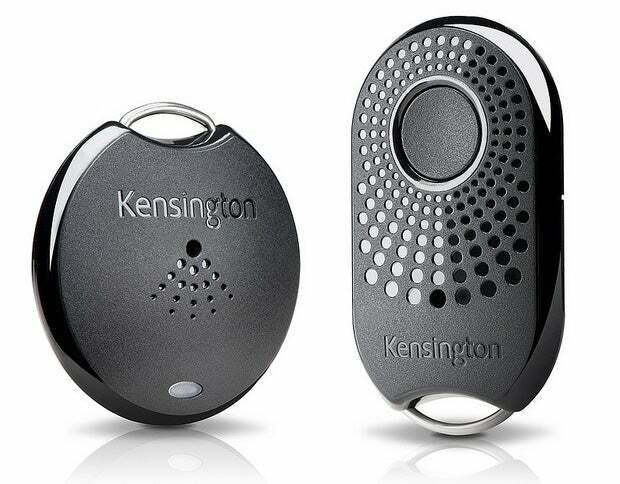 Likewise, if you have your key fob (which can be on your keychain) and you can’t find your phone, there’s a button on it that you can press and your phone will sound. In addition, an Alarm function gives you an alert should the fob and the phone be separated by the length of the Bluetooth range. For example, if you get into your car and leave the phone in the house, the key fob will alert you. The alarm is best used for situations where you don’t want to be separated from your phone (or whatever item the tag/key fob is attached to), such as in an airport, taxicab, etc. Fortunately, you can adjust the sensitivity settings on the alarm and disable it completely if you just want to use the app to help find things instead of being alerted when they are not near each other. Buy this for: A hipster friend who enjoys an eclectic decorating style, or someone who needs a lamp near their computer and only has empty bottles. This device legitimately doesn’t have a setup manual. It’s so basic that it just has a picture on the box. Put the lamp into or on top of an empty bottle (pretty much any bottle of your choosing), plug it into your computer via a USB cord, and touch the on button -- ta da! It’s working. It creates a soft glow and it’s pretty. I was hoping that the USB cable would charge a battery on the lamp, so you could create these “bottle lamps” and place them anywhere. Sadly, you have to keep the USB cable plugged in at all times. The cord ruins the sleekness of the lamp a bit for me. Also, the part that inserts into the bottle is longer than the unit’s “lamp shade”, so I’d recommend using a tinted bottle. The lamp throws enough light to read by, but wouldn’t necessarily bother a sleeping roommate. The Satechi website says the LED light can last for about 50,000 hours. It’s a neat idea and can be handy in several situations, but only if you’re near a USB charging port (either on your computer or a power adapter). Buy this for: Any musician, podcaster or audio-recording enthusiast looking for better audio from their iOS or Mac OS devices. While both iOS and Mac OS devices can record audio and provision a variety of other functions of use to both musicians and those who want to record audio for other purposes, the built-in microphones provided by Apple just aren’t good enough for many. 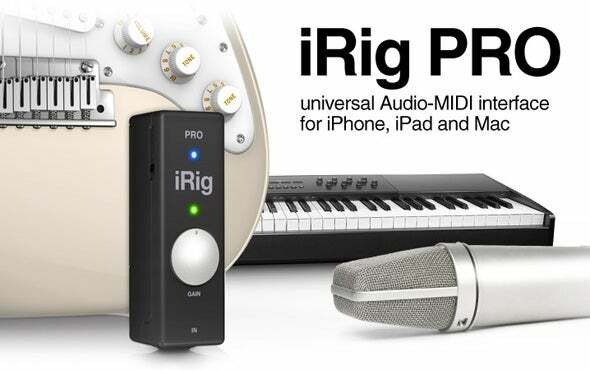 What’s needed is a decent interface -- and the iRig PRO from IK Multimedia fills the bill quite well here. First of all, this is a universal audio interface. Included with the unit are 30-pin, Lightning, and USB (this one for the Mac) cables, and sources can be XLR (balanced) or 1/4" (unbalanced). This means you can directly hook up even professional-class microphones (as I do in our studio here), including those that require 48-volt phantom power (that’s built-in as well), or even musical instruments -- essentially any audio source. There’s also a MIDI-in port (although this requires a special cable, which is also included) so you can use an external MIDI controller, like a keyboard, with the iRig Pro. There’s a great big preamp gain knob right on top, so setting levels is simple and convenient. And it’s small -- pocket-sized, in fact, and it runs on a single 9-volt battery. There’s lot of software included as well, although the specifics vary by platform (iOS or Mac). There are free versions of Amplitube, and guitar-effects package, as well as VocalLive for voice processing, SampleTank (for sampling audio), and iGrand Piano, which is a pretty-nice-sounding piano if there ever was one. The Mac software set includes T-RackS audio-production software. Buy this for: The beginner audio enthusiast who needs to connect microphones to an iOS or Android device. If you’re looking for something a bit more compact, the iRig Mic Cast is a very small microphone that plugs into the audio port on mobile devices. There’s a two-position switch for doing that coarse-grained gain setting, and it comes with voice processing and recording (but not musical instrument) software. It also comes with a very nice folding stand for handsets, and some very useful software: iRig Recorder and VocalLive (vocal processing) for iOS, and iRig Recorder for Android. The iRig Mic comes with the same software, plus AmpliTube for musicians (as the iRig mic can also be used to record acoustic instruments). Yes, the built-in mic on a handset or tablet isn’t bad -- until you try these, anyway. Anyone involved in audio recording will be your new BFF when presented with either of these. Buy this for: The guitarist looking to connect their guitars to a smartphone or tablet. In the good old days, electric guitarists would typically have all manner of dedicated foot-pedal and/or rack-mount effects units for such functions as distortion, time delay, modulation (chorusing and flanging, the “jet-plane” sound), and reverb. These then moved into the computer, so why not put them into the computers we all carry with us -- the smartphone and the tablet? IK Multimedia has been a leader in this trend with their AmpliTube software product line, and has also spearheaded the required hardware interfaces that allow you to plug your axe into your smartphone and similar devices. The iRig HD, the latest hardware unit, is a 24-bit box (OK, it’s really more round than that), featuring 44.1 and 48 KHz. sampling. It has a ¼” jack on one end for your electric guitar or bass (there’s a preamp gain control wheel to get the levels just right, and it can thus be used with line-level inputs as well), and cables for Lightning, 30-pin, and USB (for the Mac) included. No batteries are required; it’s powered by what it’s connected to. AmpliTube is actually a fairly large family of software products for iOS and the Mac. Included with the iRig Pro are the free versions of Amplitube, Amplitube Custom (to build your own personal array of amps and effects), and a variety of virtual equipment based on what artists like Slash and Jimi Hendrix use (or used -- man, I miss Hendrix). Multi-track recording is also available as an upgrade. It’s all very expandable -- clever marketing, of course, but there’s a wide array of function here and quite literally something for every guitarist. It’s much easier to use the various software tools on an iPad (or a Mac; the software is a little different but still very useful here) given the larger screen context, but they do work on an iPhone. Note, though that you’re really buying into an ecosystem here, with in-app upgrades and lots more software to buy. This could really, then, be the gift that keeps on giving, with more function at every turn, um, download -- assuming that you or your giftee are willing to keep on buying. IK Multimedia’s reputation is intact -- the iRig HD is the latest flagship in a long and robust line of products that will make any musician on your list very happy indeed. Buy this for: The guitarist on your list who doesn’t have a golden ear.